« Smart Customers Acquire Superhero Powers! Outsmart your competitors. Buy the book. Smart customers want to talk to, access, interact with, and ask questions of your company. Right now. From wherever they may be. We live in a world in which whether you are out in the woods, at a client’s business, or in your living room, you can connect information and processing power with people and devices that need it right here and right now. This is a giant departure for everything that has come before in business, life, and the world. Today, unless there’s something wrong with our phones or computer, we are almost never without access to guidance, to others, to ideas, and to possibilities. As the word “disruptive” suggests, this change is not happening in a steady and predictable way, but rather in a manner that most threatens established organizations, which are slower to change. The main question is pretty simple: Can your firm anticipate the impacts of these forces so that it gets smarter faster than competitors and customers? ▪ Social Influence means that the opinions and experiences of countless other people come between your firm and its customers. ▪ Pervasive Memory makes it inevitable that companies will begin to profitably leverage the data generated by the trillions of interactions and transactions made through digital devices. ▪ Digital Sensors expand exponentially the scope of actions, events, and behaviors firms can sense…and to which they can respond. ▪ The rise of the Physical Web has begun. Today, we are linking objects and locations in the real world like we do on the Web. These forces will require every business to rethink, and in many cases reinvent, their business models. They are not unpredictable, but potent and unavoidable. “What level of customer experience must we provide, and how will we do it?” becomes a life or death question for senior executives, and the time to answer it is now. Posted on June 7, 2012 by Michael Hinshaw and Bruce Kasanoff. 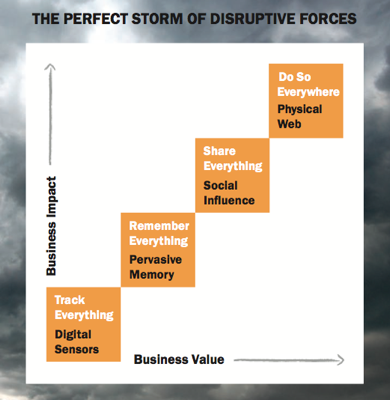 This entry was posted in Digital Sensors, Pervasive Memory, Physical Web, Social Influence and tagged disruptive innovation. Bookmark the permalink.